Indeed she got her wish. 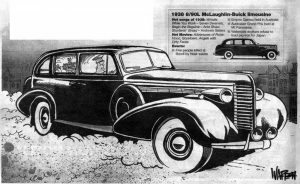 In 1938, the diminutive Queen Wilhelmina took delivery of a magnificent Canadian-built straight-eight cylinder McLaughlin-Buick 8/90L (Limousine) and was able to show all the fascist kids on the European block just how refined a bit of brash American know-how could be. 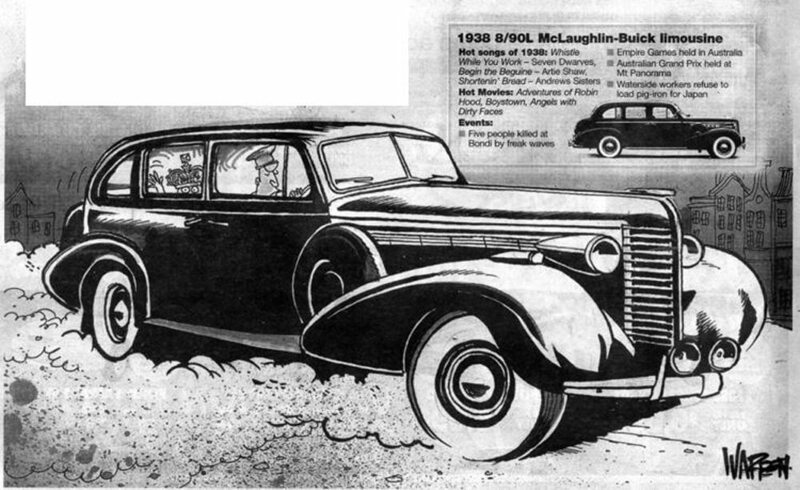 The 8/90L was a truly majestic car, built in Ontario by McLaughlin’s coachbuilders, a firm of craftsmen renowned for precision carriage-and-sleigh construction. Queen Wilhelmina wasn’t the only monarch enamoured with Buick before World War II – she followed a line of Buick limousine devotees which included the King of Italy and Edward VIII, who drove to the wharf in his Buick limousine, chucking in his job as the King of England to be with the love of his life, Wallis Simpson (who, coincidentally, also owned a Buick limo). But Queen Wilhelmina’s Buick was unique. Because of her tiny stature, the rear seats in this gargantuan car were raised and padded to dizzy heights so that her loyal subjects could witness the royal wave. For the same reason, an extremely low-geared differential enabled slow speeds even in top gear. To co-ordinate all this, the car was fitted with a cumbersome intercom from the glass-divided driver’s compartment to the rear, where the monarch could issue directions. But in 1940, Hitler’s armies marched into Holland and the Queen was forced into exile in England. During the German occupation of Holland, the Queen’s daughter Juliana sought refuge in Canada, where she gave birth to a daughter, Beatrice, while the Buick and the chauffeur were sent to the Dutch consulate in Melbourne. After the war, and fed up with Europe, the Queen’s chauffeur promptly retired in Australia and was given the car as reward for his service. Hanging up his cap and driver’s gauntlets, he embarked on a career as a potato farmer in Victoria, where the car found a new job as a truck, carting sacks of spuds until the Buick simply became too expensive to run. The Buick passed through various hands, including those of a bunch of surfers, until it found its way into the collection of Basil Keir, a Buick enthusiast in southern Sydney. When he bought it in the 1980’s it was nothing more than a stack of parts, but it was a car he had been after for years. “The bloke who owned the Buick agreed to sell it to me a day before the auction,” says Keir. But there was nearly a riot when everyone else found out the next day. People had travelled from all over the country to bid for the car.